Turn any tripod into a mobile workstation with the new GoPlatform from Benro’s SystemGo. Today, Benro announced the SystemGo GoPlatform laptop support. The GoPlatform allows you to turn any tripod into a mobile workstation with any 13 or 15 inch laptop. The GoPlatform securely holds your laptop and can be mounted to any tripod or lightstand by means of a 5/8” socket, 3/8-16 female adapter, 1/4-20 female adapter or Arca Style mount. Combined with the SystemGo tripod and a longer accessory GoRail it becomes a perfect companion for tethered shoots allowing single tripod operation. SystemGo is more than just a tripod. It grows into an entire system or a complete photo workstation by simply adding SystemGo components. Convert to a digital workstation with the GoPlatform laptop support or mount dual cameras with the GoCoupler for anything from portrait to long exposures to landscape to macro to food photography — all without the use of tools. Within SystemGo you have your choice of two tripods: GoClassic and GoTravel. 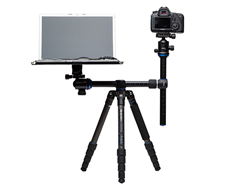 GoClassic tripods provide exceptional rigidity and are available in a variety of sizes. These tripods are made using Aluminum Alloy or Carbon Fiber legs in combination with strategically selected cast and machined aluminum and magnesium alloy components. The GoTravel tripods are travel friendly tripods that use reverse folding legs to make the tripod as compact as possible. Each GoClassic and GoTravel tripod includes a quick-flip 90⁰ center column that goes from vertical to horizontal without the use of any tools. This patented design allows the column to be used as a lateral arm — perfect for when you want to shoot down or over your subject. Whether you shoot studio or location, macro or illustration, fashion or food — the 90⁰ feature allows you to easily position your camera for the perfect perspective. Both tripods can be converted to full size monopods simply by combining the center column and removable leg. Both GoTravel and GoClassic designs are available in either aluminum or carbon fiber and in three family sizes. About Benro: Benro continuously strives to develop lighter and stronger award-winning products to meet the needs of the most demanding professional photographers and filmmakers. By gathering input from photographers and filmmakers worldwide, Benro has been able to engineer products designed for use by working professionals. Benro products are exclusively distributed by MAC Group in the USA.